It is time again for your friendly neighborhood (or virtual neighborhood) SQL CSS person to provide you with the next set of tips for the various tools that he uses in his day-to-day work. I probably use this tool “RML Utilities” or the database created by this at least once a day and sometimes even more. Not kidding!! This tool has become synonymous with Profiler Trace analysis collected from customer environments in CSS. Majority of you might be familiar with the tool “SQL Nexus” which call RML utilities in the background to load the collected Profiler Traces into a SQL Server database. This calls an executable, ReadTrace.exe. In this post, I will talk about a few conditions when you should be calling ReadTrace.exe instead of invoking it from SQL Nexus. As you can see above that SQL Nexus provides you the option of breaking down the activity of each SPID into individual .trc files but they can only be directed to the %TEMP%\RML folder on your machine. The previous server that I had didn’t have sufficient disk space to hold over 100GB of data in the TEMP directory. Yes, we do analyze data which runs into a few hundred GBs at times! Now you have two options, change the %TEMP% environment path on your machine to a different drive or use the ReadTrace.exe to generate the .trc files in the required path. Another option that cannot be controlled from SQL Nexus is the ability to add SPID, Hostname and Application filters while importing the data. -E Use windows authentication while connection. Here are a few scenarios where I use ReadTrace.exe directly…. Sometimes the deadlock graph is not sufficient to figure out why a lock is still held by that session and why that session acquired the lock on the object in the first place. At that point, you need to track down the sequence of statements executed by the session. In this case, I will use the following command to import the data. The above command will import the trace files into a database dbRMLUtilDemo on the default instance on the machine with a SPID filter of 53 and 55 and exclude events generated with the application name SQLCMD. Additionally, individual .trc files will be generated containing the activity of SPIDs 53 and 55. Use the –o parameter to change the output path and use the –s, –A and –H filters to apply the necessary SPID, application name and host name filters respectively. An example to apply filters for SPIDs 51, 52, 53, exclude events generated by application name PSSDIAG or hostname MyLaptop. -I"D:\RML\RMLUtil_demo.trc" -A"!SQLCMD" –s51 –s52 -s53 -o"D:\RML\output" –H"!MyLaptop" –A"!PSSDIAG"
ReadTrace has limited processing ability for handling sessions using MARS (Multiple Active Result Sets). You have to use –f and –T35 to import data from trace files which contains MARS sessions. ReadTrace uses the formula ((Session Id * 10 ) + BatchId) so that a MARS sessions appears as a separate session. Eg. If you see Session ID 1620, 1621 and so on in the ReadTrace/SQLNexus database but cannot find such a session in the DMV outputs captured during that time, then the activity corresponds to Session ID 162 which was using MARS. Note: And remember to always use a Server Side trace whenever possible to capture a profiler trace output to a local disk. The PDF help files for RML Utilities are located at <system drive>:\Program Files\Microsoft Corporation\RMLUtils\Help folder by default on a machine where RML Utilities is installed in case you wanted more information on the above. Keep following the tag “Tools tips and Tricks” for more posts on the various tools that we use. That’s it for today! I have stored the output captured by the above query in a file called CustomRowset.OUT. Using the Edit Custom Rowset option in the SQL Nexus UI (available in the third expandable tab named Data, on the left hand side), I can pull up a UI where I can specify the table name into which the data needs to be imported into (tbl_RequestsExample in this case) and the identifier for the data which needs to be imported (— RequestsRowset in this case). I was executing a WAITFOR DELAY command from another session while the above script was capturing data. I then import the data into a SQL Nexus database using the Importoption. Once this is done, I can then query the database and look into the results which were imported into the database. (see screenshot below). You can extend this functionality to any degree you want and even combine multiple T-SQL commands to capture different result sets in the same loop. 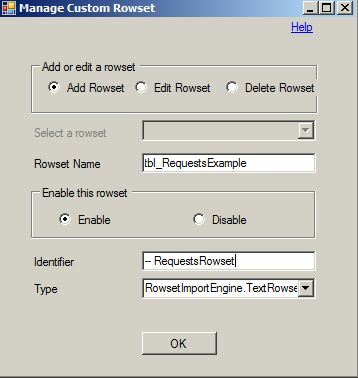 You just need to make sure that the rowset identifier for each query result set is unique. System.Data.SqlClient.SqlException: The size (8192) given to the column ‘query_text’ exceeds the maximum allowed for any data type (8000). 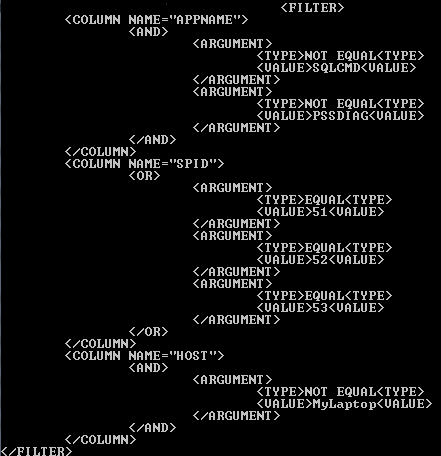 SQL Nexus 3.0 doesn’t give you the option to add your own column data types using the UI. Using the form (shown on the left) will treat all columns as varchar. If you want to change this behavior, then modify C:\Users\<user name>\AppData\Roaming\sqlnexus\TextRowsetsCustom.xml directly to add or modify the data types that you want. Let’s say I decided to collect the output of customized T-SQL script for an extended period of time. Instead of scouring the .txt or .out file manually using a text editor, I can import the data into a table and then run queries on them to save yourself a hair-raising experience and valuable time! How do I make sure that the data is imported correctly? 1. If you have data which is larger than varchar(8000) in the result sets collected, then make sure to modify the TextRowsetsCustom.xml before you import the data. 2. Give each rowset that you collect an unique identifier. You don’t want the importer to mix-n-match the data you are importing. 3. Add a runtime column using GETDATE() or a variable for scripts capturing data in a loop to ensure that you can track the trend easily without having to second-guess. 4. All columns that are collected in the result set(s) have to be named. 5. Avoid CR/LFs in the result set i.e. don’t use CHAR(13) in your T-SQL script while capturing the data as this seriously confuses the importer as it treats CR/LFs as end-of-row indicator. 6. Either capture the data directly into a file by running the data collection script from Management Studio or use sqlcmd -W parameter if you are capturing the data using sqlcmd. -W ensures that trailing spaces from the result sets are removed. That is all I have for today. Happy customizing and importing!